Hugely popular in the States, children’s author and twice Newbery Medal winner Kate DiCamillo hasn’t had the same traction this side of the pond. Yet. 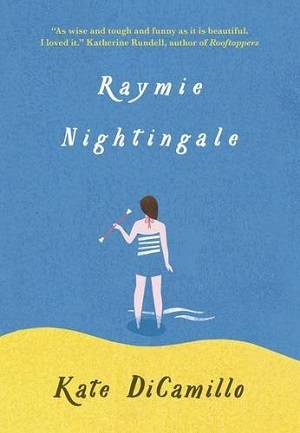 Her latest novel, Raymie Nightingale, a coming-of-age tale set in small town America in 1975, looks likely to be a big hit. Ten year old Raymie thinks that she can entice her estranged father home. She decides to enter and win a local pageant, thereby ensuring her photo will appear in the local newspaper, and her father will see it and realise what he’s missing, and return home. The reader first meets Raymie at a baton-twirling lesson, taught by 50 year old Ida Nee. From Raymie’s undertaking to do a good deed for her pageant application form – she volunteers at the Old People’s Home and has a wonderful encounter with a true personality, to the influence of Old Mrs Borkowski, to her memories of her ‘Life-saving 101’ teacher, who carefully made his own ‘dummy’ for them to practise lifesaving. From her father’s secretary, whom Raymie rings at the insurance offices to hear her reassuringly say ‘How may we protect you?’ when she answers the phone, to Ida Nee and her baton trophies, the misfits, oddbods and ordinary people make up a community that has a long-lasting impact on a little girl’s life – just as much as her peer friendships. Raymie’s emotions are laid out by DiCamillo as reflections on how her soul is doing – whether it is squashed small inside her, or soaring and filling like a balloon. It’s simple and effective, and seems true to the innocent young girl being portrayed. But what also pushes through, as well as the three girls’ transparent emotions, is their absolute determination and grit to win through, despite their confusion with the grown up world. “’How were the lessons?’ She [Raymie’s mother] asked when Raymie got in the car. There are bite-sized slices of humour embedded in the text too, from the school librarian’s speech imploring Raymie to ‘diversify’ her reading material, resulting in Raymie’s borrowing of a book about Florence Nightingale, which “looked like a horrible, depressing book”, to Raymie’s own inimitable way of taking grown-ups literally, as she ‘flexes her toes and isolates her objectives’ before starting on a task. The writing begs another look at Kate DiCamillo’s other books, including the famous Because of Winn-Dixie. It’s a privilege to put books like this in the hands of children. Letting them soak up pared down yet excellent writing, so that they can discern what works and what doesn’t, and learn how to be excellent wordsmiths themselves. With the backdrop of a rather quirky little story. You can buy a copy here.